Let us now investigate how the solar wind and the interplanetary magnetic field affect one another. The hot coronal plasma making up the solar wind possesses an extremely high electrical conductivity. In such a plasma, we expect the concept of ``frozen-in'' magnetic field-lines, discussed in Section 7.3, to be applicable. The continuous flow of coronal material into interplanetary space must, therefore, result in the transport of the solar magnetic field into the interplanetary region. If the Sun did not rotate then the resulting magnetic configuration would be very simple. 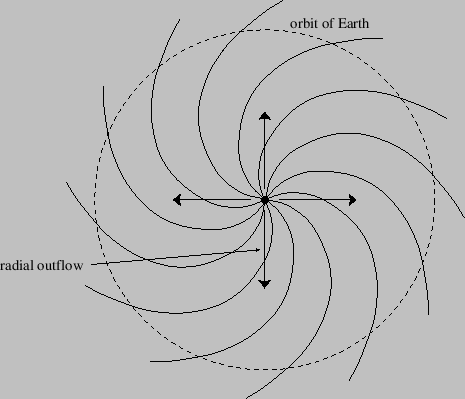 The radial coronal expansion considered previously (with the neglect of any magnetic forces) would produce magnetic field-lines extending radially outward from the Sun. The latter field arises because the radial plasma flow is no longer parallel to magnetic field-lines in the stationary frame. Figure 7.4: The interplanetary magnetic field in the ecliptic plane. The interplanetary magnetic field at 1 AU is observed to lie in the ecliptic plane, and is directed at an angle of approximately from the radial direction to the Sun (Priest 1984). This is in basic agreement with the spiral configuration predicted previously. where is the Alfvén speed. It turns out that at 1 AU. On the other hand, close to the base of the corona. In fact, the solar wind becomes super-Alfvénic at a radius, denoted , which is typically , or of an astronomical unit (Priest 1984). We conclude that the previous analysis is only valid well outside the Alfvén radius: that is, in the region . Well inside the Alfvén radius (i.e., in the region ), the solar wind is too weak to modify the structure of the solar magnetic field. In fact, in this region, we expect the solar magnetic field to force the solar wind to co-rotate with the Sun. Observe that flux-freezing is a two-way-street: if the energy density of the flow greatly exceeds that of the magnetic field then the magnetic field is passively convected by the flow, but if the energy density of the magnetic field greatly exceeds that of the flow then the flow is forced to conform to the magnetic field. for . This corresponds to co-rotation with the Sun inside the Alfvén radius, and outflow at constant angular velocity outside the Alfvén radius. We, therefore, expect the solar wind at 1 AU to possess a small azimuthal velocity component. This is indeed the case. In fact, the direction of the solar wind at 1 AU deviates from purely radial outflow by about (Priest 1984).